Description: First Frost Hostas have rounded blue-green leaves with cream colored edges that can turn white in part shade. As the name suggests, this variety stays looking good until the first frost in the fall. Around July they shoot up lavender flowers above the foliage. Hostas are extremely popular, hardy herbaceous perennials grown primarily for their beautiful foliage. They are easy to grow, shade-tolerant plants. Leaves come in a wide range of shapes, colors, sizes, and textures and may be solid in color or variegated in different combinations of blue, green, white, and gold. The plants are low maintenance. Hostas originally came from Japan, China, and Korea. They were first introduced to Europe in the late 1700s and then came to the United States in the middle 1800s. Spacing: Plant 24″ to 36″ apart. Height: Grows 1′ to 2′ tall. 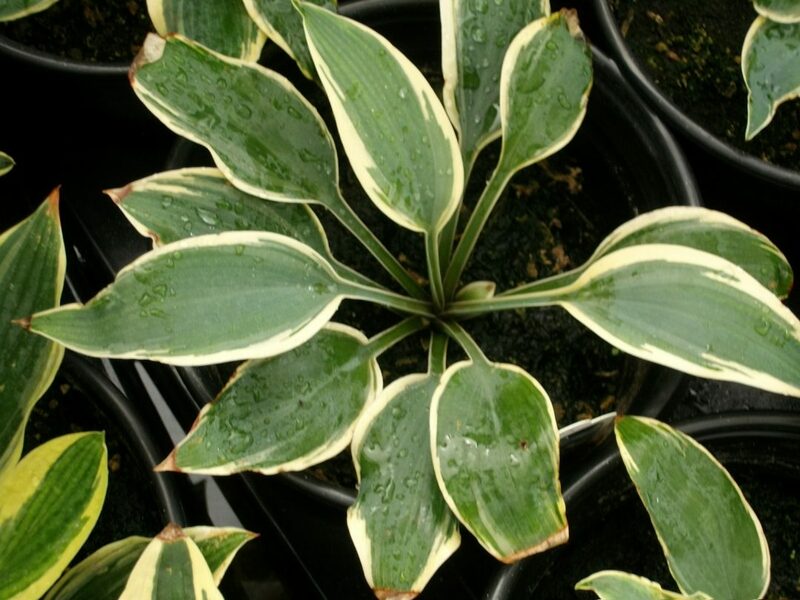 Outstanding Features: American Hosta Growers Association’s 2010 Hosta of the Year. Tips: Likes sandy, loamy soil for better root aeration and shady woodland settings.